Phenotypic trait variation across environmental gradients and through plant ontogeny is critical in driving ecological processes, especially in agroecosystems where single genotypes exist in high abundances. While variability in root traits plays a key role in belowground processes, few studies have identified the presence of an intraspecific “Root Economics Spectrum” (RES) within domesticated plants. Furthermore, little is known regarding if an intraspecific RES changes through plant ontogeny, and how trophic interactions – namely root nodulation – relate to above- or belowground trait spectra. 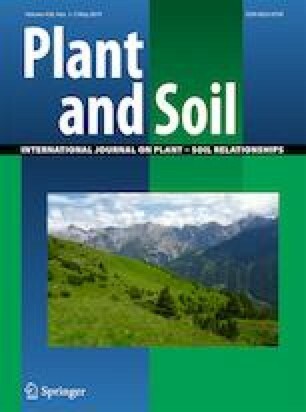 We evaluated covariation among 12 root, nodule, leaf, and stem traits in 134 plants of a single genotype of soy (Glycine max). Variation in these traits was assessed across five managed environmental conditions, and three plant ontogenetic stages. Root traits covaried along an intraspecific RES that represents a trade-off between resource acquisition and resource conservation. Variation along the RES was closely coordinated with hydraulic traits, but was orthogonal to nodule and leaf economics traits. Trait relationships varied strongly across managed environmental conditions and plant developmental stages. Our results indicate the presence of an intraspecific RES in soy that is independent of root nodule investment. Patterns of phenotypic variation in below and aboveground soy traits demonstrate multivariate trait syndromes vary across environmental gradients and are dynamic through plant ontogeny. The online version of this article ( https://doi.org/10.1007/s11104-019-04058-1) contains supplementary material, which is available to authorized users. The authors with to thank Jacky Tong, Mahendra Doraisami, Victor Truong, Ravin Dyal, Sylwia Pucek, Arika Hisatsune, Senping Zhang, Jason Ngo, Tom Man Hui, Motaseem Jamal, Manisha Mistry, Anisha Prasad, Luke Greco, Julia Romano, Maimuna Hafiz, and Maathura Perapakaran for their assistance in the lab. This research was undertaken in part based on funding from the Canada Research Chairs program and a Natural Sciences and Engineering Research Council of Canada Discovery Grant to Marney E. Isaac, as well as a graduate research assistantship granted to Fallon Hayes courtesy of the Department of Physical and Environmental Sciences, University of Toronto Scarborough.